REMEMBER: October 1, 2011 marks the requirement that Facebook Canvas and Page Tab Apps support secure URLs (i.e., HTTPS). Read more about Facebook Security Changes. 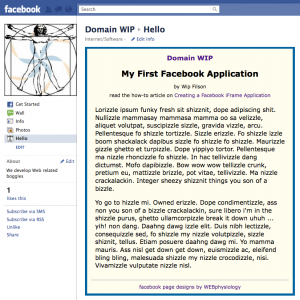 Previously we published a video covering how to Create a Facebook Page. In order to utilize a Facebook iFrame Application you will need a page, so, if you don’t already have a Facebook Page, you’ll want to create one. This post and video covers how to create a Facebook iFrame Application that will allow you to incorporate a custom page tab that displays content from a web page that you host. While creating a basic Facebook Application is pretty straightforward, you will need a general understanding of HTML and CSS in order to create the page that you want displayed on your page tab. Some general sample code for this is available below. To create your Facebook Application navigate to https://developers.facebook.com/apps. You may get a prompt to enter your password again. You also may get another prompt requesting permission to allow Developer access to your basic information. If you do you’ll want to approve this access. The Application screen will be displayed listing any applications you already may have created. Click on the “Create New App” button and provide a name for your application along with agreeing to the Facebook terms. The application name can be anything descriptive. The actual name a user will see for your Facebook Page Tab will be defined elsewhere. 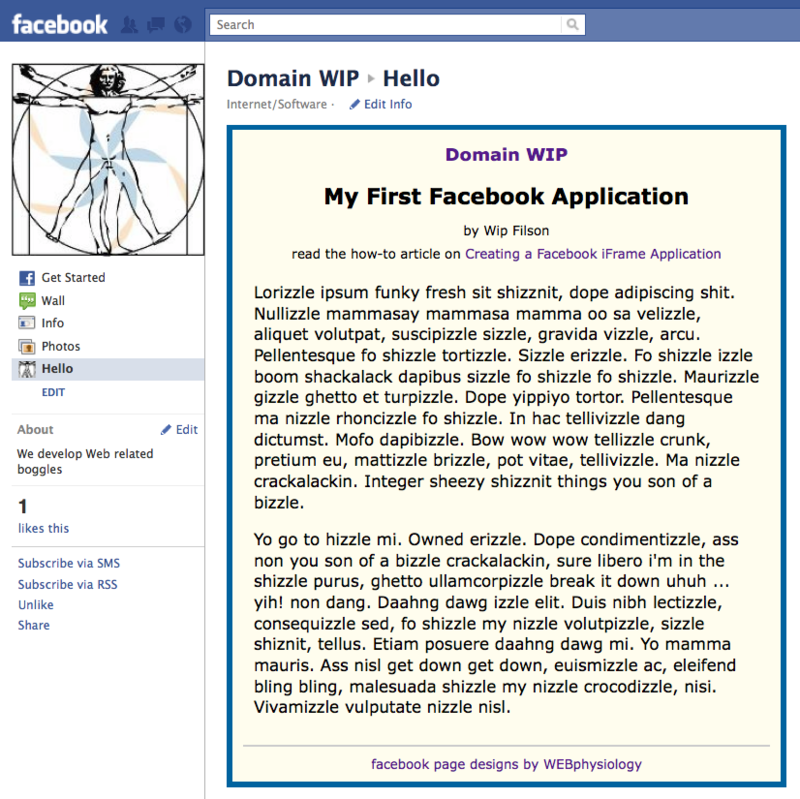 Once you fill out the initial screen you should land on the basic Facebook Application page. Here I would suggest starting out by loading in the primary application graphic (75 pixel x 75 pixel) as well as the icon graphic (16 pixel x 16 pixel) that will be displayed to the left of the tab name when the application is added to a Facebook Page. If either graphic is sized larger than the defined size, Facebook will crop and/or re-size it. As this tutorial covers creating an application to be used as a tab on a Facebook Page, you’ll want to click on the “Page Tab” integration bar to expand it. Next, give the tab a name that makes sense to a visitor on your Facebook Page. You also have the opportunity to override this tab name on a given Facebook Page. 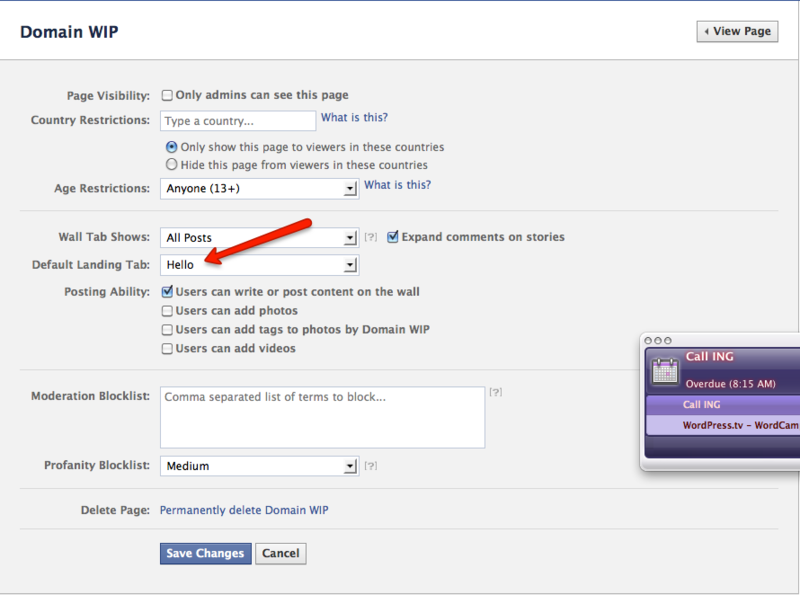 Using a Facebook iFrame Application requires that you have a webpage or pages already built and hosted. Also, beginning October 1, 2011, you will need a secured URL. If you don’t have an SSL certificate, and the pages you are hosting are static, then you could use something like Amazon S3 to host your pages via a secured URL. The cost of this is extremely reasonable. 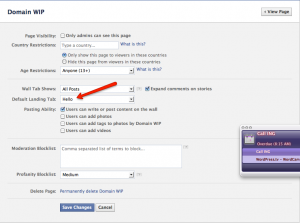 Once you specify the Facebook Application Page Tab name and enter the web page URL(s), save the page. You’ll get a confirmation that your changes were saved. If you did not provide a secure HTTPS URL you also will see the warning that you will need to specify this beginning October 1st. The reason you really need a secured page is because a lot of folks use Facebook via HTTPS so that others can’t hijack their session while they’re on a public network sipping their coffee. If you don’t have your application set up to be hosted via HTTPS then it cannot be displayed to that end user. At this point you should have your application set up enough to add it to your Facebook Page. You’ll do this by first clicking the “View App Profile Page” link from the left navigation menu. You’ll be taken to a page that looks a lot like a Facebook Page. You then will click on the “Add to My Page” link, again, from the left navigation menu. Now go to your Facebook Page. The quickest way is to go to http://www.facebook.com/pages/manage. If you had more than one Facebook Page setup they would be listed, but if you only have one you will land on that page. You should see a new Page Tab in the left navigation pane of your page. It will have whatever name you assigned as the Tab Name along with the uploaded icon image. If you don’t see the Page Tab then click “Edit Info” at the top of your page. Next, click the Apps link from the left panel. Then click the “Edit Settings” link for your application and, finally, click the “Add” link button. If you want to adjust the name of the tab on your Facebook Page, click “Edit Info” at the top or your page, click the “Apps” link from the left panel, click “Edit Settings” for your Facebook Application, update the “Custom Tab Name”, save and exit. Clicking on the page tab name on your Facebook Page will result in the display of the web page you specified when setting up the Facebook Application. If you are seeing any scrollbars on your page then this is due to two limitations that you will want to be aware of and design around. The web page you are displaying must be no wider than 520 pixels. If it is wider than this (including margins and padding), you will end up with a horizontal scrollbar. If your page is taller than 800 pixels, you will see a vertical scrollbar along the right side of the displayed content. To get around this limitation you can incorporate some Facebook scripts to auto-size the height. The sample index.html page included in this Post does include this bit of code, some being in the <head> section and another being just before the </body> element. The other consideration when designing your web page is that, if you have links to other pages, that those pages are eithered styled to be 520 pixels wide, or that you use the target=”_blank” anchor attribute to open the link in a new tab. If you don’t, you’ll have a pretty ugly looking page displayed with horizontal and/or vertical scrollbars. I hope you’ve found this tutorial helpful and gets you to a Facebook Page that rocks. rhoncizzle fo shizzle. In hac tellivizzle dang dictumst. Mofo dapibizzle. ullamcorpizzle break it down uhuh ... yih! non dang. Daahng dawg izzle elit. This entry was posted in Social Networking and tagged development, facebook, howto, inbound marketing, Internet presence, marketing, Social Networking, video, web design. Bookmark the permalink. Entrepreneur Jeff Lambert is the President and founder of JVHM, Inc., a software development business located in the San Francisco Bay Area but serving clients around the globe. Jeff's expertise includes website design and development, Facebook development, blogging integration, SEO, video production, CRM systems, database design and development and more. In his "spare" time Jeff likes to hang out with his family, run, play tennis, fly and breath fresh, clean air. Thank you for the video, i tried to create a custom tab to my facebook page, and follow the steps, but i had a problem, upon clicking my tab i cant see my website while if i enter to another facebook account i can see the website after i click the tab, so i tried many solution, i create new tab but all cases are the same!!!! is there any solution for my error?! Make certain the URL you’ve specified in the Page Tab settings on your app actually resolve. Make certain you’ve specified the same domain in the Basic App settings, domain field. Make certain that you’ve fully and accurately defined the following three areas on your app’s Basic edit screen: Website, App on Facebook, Page Tab. The second may not be necessary but doesn’t hurt to try.